Review of Great Divide Fresh Hop Pale Ale | Beer Apprentice - Craft Beer News, Reviews, Interviews and Info. 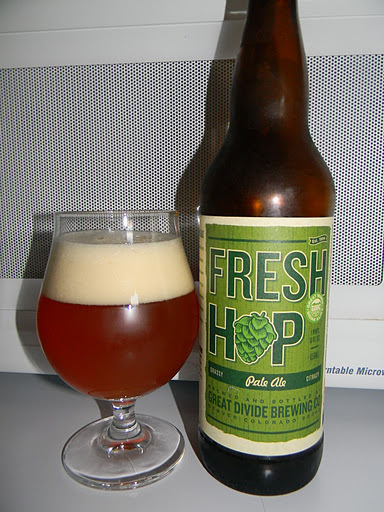 For my first craft beer review of 2012 I’m going to be trying a Fresh Hop Pale Ale brewed by the Great Divide Brewing Company located in Denver, Colorado. I’m really hoping that this new year goes as well as 2011 did as far as my reviews on this beer blog. I’ve tried many great beers, met a lot of great people and hope that I can continue along the same path over the next 12 months. The website, greatdivide.com, has this to say about the Fresh Hop Pale Ale. Fresh Hop Pale Ale is brewed with fresh, whole cone hops from the Pacific Northwest. We ship these “wet” hops to Denver overnight and brew shortly after harvest, imparting an intensely grassy hop aroma and citrus hop flavor in a medium-bodied ale. This brew comes in a 22 oz. bottle and stands in at 6.1% ABV. The beer poured a semi-hazy, brilliant, pale orange color. A medium aggressive pour produced a gorgeous, barely off white head that was wonderfully sized, creamy, smooth and soft. The retention time was outstanding and the lacing was nice looking, sticky and clingy and left a thin film on top for the entire drink. This was a very pretty beer. The nose revealed fresh grassy and citrus hops. Hints of pine, grapefruit and orange intermingled with light bready notes and caramel malts. Very floral and perfumy. I think I may have even been detecting a minuscule fragrance of yeast also. Overall, very bright and fresh smelling. Not overly complicated, but very well put together. The taste was quite similar to the smell. Tones of pine, grapefruit and orange brought forth a significant amount of hop bite and bitterness. Very clean and fresh. More indications of breadiness along with a modest sweetness from the caramel malt as well as a scant amount of honey. Only a trace of alcohol was tasted at the very beginning, but it was long forgotten after I had a few swigs. The mouthfeel was medium bodied, smooth, sticky, snappy, crisp, clean and very dry. An exceptional amount of bitterness and flavor drenched the palate after each sip. I was able to wait several minutes between gulps and was never left without flavor. I’ll tell ya. I really liked this beer. It was very pungent and forceful for a Pale Ale in my opinion. I think this would be a superb beer for Spring and Summer. In fact, it was quite nice on this first day of January. It was super easy to drink too. I had absolutely no problem finishing this bomber all by myself. In fact, I would like to have another one. This brew is only released from October through December, so it may be a little harder to find now, but when next years batch rolls around, be sure to pick up a bottle or two and enjoy this very tasty beverage. Thanks for reading and commenting everyone. Have a great 2012!!! Until next time.